This page is about adding a gable roof over a proposed new porch. It is in response to the question below that I received from Joe and Teresa who live "just outside of Philadelphia, PA."
We would really like a front porch to enjoy the yard and weather. Presently, we cannot use the front of the house in the summer as there is no protection from the extreme heat. We appreciate any help you could provide us. Teresa sent me three photos of the house, one of which she marked with a pen to show me what they had in mind. The above sketch is a simple rendering of what I saw on the photos without any unnecessary detail. The first thing I do when asked about adding an extension is check the site. We have varying regulations as to how close we can build to our boundaries. It is different for the from and the sides, and different again at the rear. We have a thing called plot ratio. Say our plot ratio is 1:1, so if I have a 1000 sq.M. block, I can only use 500 sq.M. of it for a house. Check that any proposed extensions don't exceed your plot ratio. As I have said before, when planning something like an addition, check your local regulations. Gable roof - a normal hip addition. So what Joe and Teresa are planning is a 20' x 8' front porch to the front right and side, covering an exiting small entrance. Again I'll repeat what I've said elsewhere, when designing an addition I always try to make it look like it grew there. By that I mean that it will look like it is part of the original design. The other way to go is to make a complete change in design, make a feature of the new work. Definitely no half hearted attempts that don't quite make it. In this instance I have drawn a hip extension, keeping it in line with the existing, the same eaves overhang and I would say using the same shingle roofing that the house already has. The new roof would be attached to the existing similar to my scotch valley sketch, not disturbing any of the old structure and fixings. Here is the same plan again with an open gable end. I have just sketched in a couple of columns. The span of 20' is no problem. 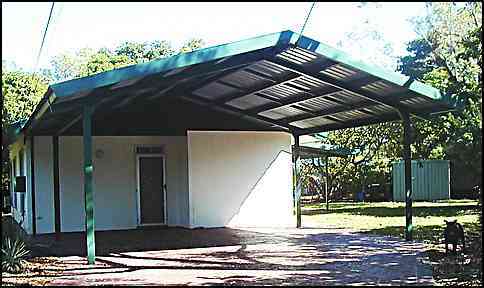 I guess I am thinking of something like the carport on my steel roof page. The actual job will more than likely all be timber construction, so the builder will work out the beam sizes and how and where they are connected to the building. If you have an open roof with no ceilings, the section where the old meets the new will have to be considered. Above is an idea of what the porch extension would look like, if it was built with a conventional gable roof. By this I mean a typical framed roof that has ceiling joists that span across and tie in with the rafters. For this type of construction 20' is a bit of a stretch, so a centre column or even two would be used to support the hanging beams that support the weight of the ceiling joist and ceiling. Just for a bit of variety I have sketch a version that gives a different layout. Of course if metal nail plate trusses are available, then just one column at each end would be OK as they will span 20' no problems. Alternatively, a steel beam, hidden inside the ceiling line, could span the 20' and then be used to support the hanging beams. So you can see that even on a small job like this there are plenty of options, to do the same job. I guess it boils down to what is easily available to do the work, and who is available to do it. The builder may be comfortable working with steel or he may prefer to use all timber. I have drawn in the above sketch columns that have faux stone bases with tapered columns as Teresa has a preference for. Gable roof - A house under construction with a small gable entry porch. Here is a new house still under construction close to where I live in Australia. It shows a very small entry porch similar to what I have drawn, except that the eaves are lined on the slope, which simplifies the construction a touch. To the left is a section of the roof with a Dutch gable, which is quite popular here. I considered this option but because the roof pitch is fairly shallow, and the whole new roof is quite small, it would just make things more complicated and costly for little effect. To the right of the porch is another gable end with a small louvred gable vent in it. These houses have rotary ventilators in the roofs and I guess that these small gable vents are there to let fresh air in, to keep a circulation going.